Vancouver-Hastings is located between Burnaby and Commercial Drive . The constituency extends north to south from Burrard Inlet to 12th Ave.
Not living within Vancouver-Hastings? Find your MLA here! If you need help with a federal government matter (ie. taxes, passports, immigration services), please contact your federal representative. If you live in Vancouver-Hastings, this is likely Jenny Kwan, MP for Vancouver-East. We work closely with her office, which is just down East Hastings from Shane's. Vancouver Hastings is a socially, culturally, and economically diverse community located in a historic part of Vancouver. The most common languages spoken in Vancouver-Hastings are English (at 45.8%), Chinese (at 32.2%), Italian (at 4.4%), Vietnamese (at 3.6%), Tagalog (at 2.3%) and Spanish (at 1.8%). 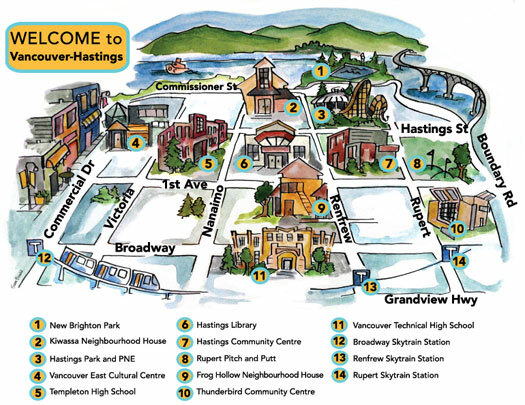 For more information about the social, economic and cultural make-up of Vancouver-Hastings, click here.